The above permalink appears to work ... but, due to a small addition to the old version of the site that handles these permalinks, the result is not quite what is desired: one must change "by hand" the programming mode (at the top) from Blockly to Editor. an optional name to display in the world select menu instead of the URL. The key here is the 3rd item. Instead of having to potentially deal with changing world format (to add new capabilities) AND permalinks to encode the new items, I only have to ensure that the world format remains backward compatible. Normal URL where a world can be found are usually quite short, and there is no need to worry about hitting some browser limit in terms of the number of characters. If you use Reeborg's World to teach and wish to be kept abreast of any major changes, please email me and I will add you to a mailing list that I just set up for this purpose. tl;dr: After two books published in Korean about Reeborg, a book on robotics written in French has a significant part of its content inspired by Reeborg's World. Tel que je l'avais mentionné il y a déjà un certain temps, Samsung avait publié deux livres en Koréen basé sur un précurseur du Monde de Reeborg. 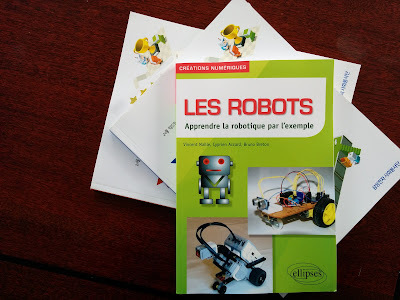 Aujourd'hui, j'ai reçu un livre sur la robotique dont environ le tiers est basé sur la robotique virtuelle du monde de Reeborg. Vincent Maille, le co-auteur du livre sur la robotique, m'a fait plusieurs suggestions qui ont contribué à améliorer mon site. Je n'ai pas encore eu le temps de lire ce livre (qu'on peut obtenir directement de l'éditeur ou de chez Amazon) ce que j'espère pouvoir faire très bientôt.